PLATTSBURGH -- About nine years ago, Grand Funk Railroad had a hit with "We're An American Band." As an American band, Grand Funk supposedly did wonderful things that those nasty foreign rockers could never do. Tom Petty and the Heartbreakers, who have just released the album Hard Promises, are also an American band, But unlike Grand Funk, who vainly sough the legitimacy of such a label, Petty and the Heartbreakers not only are an American band. They could well be the best American band. Petty and his cohorts play exciting rock and roll as easily as other people breathe. Ther music is truly classy, a rare blend of Byrds-like guitar, soaring melodies and bedrock chording. T.P. has become a rock hero in his own right, a big-nosed, blond romantic whose lyrics can surge with humor as well as pain. DETROIT -- Up in Tier C, Cobo's cheap seats, I thought I had fallen into a high school sports event. My fellow residents in nosebleed heaven looked like they were skipping their homework for Tom Petty's concert. So, for that matter, did Tom Petty, at least from afar. In his sneakers and blond page-boy hair and neat grey sports shirt he looked, and sounded, a decade younger than his 29 years. If not exactly straight, he certainly put on a straightforward show. 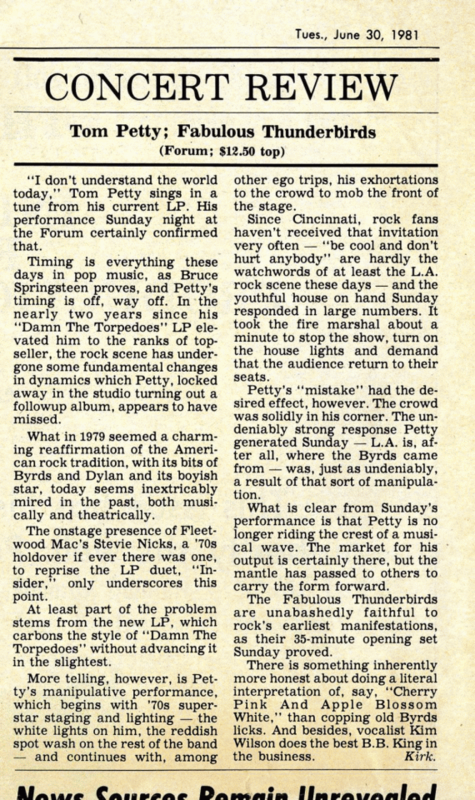 For an hour and a quarter or so he led the Heartbreakers through the hits from his Damn the Torpedoes albums and current Hard Promises which, after years of toil, finally put him in a position to draw 11,000 devotees to a concert. Don't walk under any ladders with Tom Petty. The snakebit rocker's in hot water again, this time the result of a free concert he wanted to give in Chicago. As a gift to his Second City fans, Petty arranged for radio station WLUP-FM to purchase all of the show's tickets and pass them out gratis. But the promotion's publicity angered competing AOR outlet WMET-FM, which promptly banished all Petty cuts from their playlist. The aftermath? Bad feelings, sagging sales of "Hard Promises" and a genuinely befuddled Petty. "I wasn't trying to play favorites," said Tom, who should be getting used to this sort of thing by now. "I don't care if it was Oscar Mayer Wieners, I would have let them buy the tickets." The concert had to be postponed anyway -- remember, this is Petty we're dealing with -- after Tom tore some tendons in his knee while bouncing on his trampoline ("I'm too lazy to jog"). His doctor advised him to stay off the leg and not move around. Petty's retort: "Do you know what I DO for a living?" Universal, we hear, wants someone to come up with a motion picture idea to star blond, blue-eyed rock star Tom Petty. Tom Petty and the Hearrtbreakers. "Hard Promises." This fine album's release was delayed by a dispute between Tom Petty and MCA about the disc's list price. Petty wanted it to be $8.98; MCA wanted $9.98. Petty won. Hard Promises is a winner of an album. It's study, ambitious, and packed with rivering music, lyrics and performances. It's sharp with insights about hard times, hard hearts, hard luck and the hard promises all lovers and losers have to live with. On "The Waiting," the disc's most ambitious track, the singer hs found his lover, but the search was a struggle. "Nightwatchman" is a portrait of a man on society's edge, uncertain of his inner security. "Something Big" tells about a man who went over the edge. "Insider," the album's most beautiful moment (with a harmony vocal by Stevie Nicks), is a haunting regret by a lover who has been denied. Producer Jimmy Iovine has done a great job with the Heartbreakers sound: a fluid wall of guitar, fronted by the austere poignancy of Petty's vocals. We've waited so long for something from Tom Petty & The Heartbreakers that reaction is predictably positive and strong on the first single from his new album "Hard Promises." Called "The Waiting," (Backstreet), it's everything we expected. For some fans, that's good news. For others who hoped for some unknown tangent, hold on. I think Petty's too smart to fall into a rut. LINER NOTES: Where there's smoke, there may not always be fire. Although there have been reports that Tom Petty will be starring in a movie, and that he has been offered $3 million dollars to star in and score a musical, these are apparently premature. Also premature is another report which says that Universal Pictures is looking for a vehicle for Petty. According to a spokesman for Petty's management firm, Petty is getting offers, "... some more interesting than others, but we haven't accepted any yet." The spokesman did say, however, that Petty would like to try his hand at film, "at some point, when the time and the type of movie is right, but not right now." TOM PETTY AND THE HEARTBREAKERS -- Hard Promises (Backstreet-MCA) -- This rock group is pretty much at its peak. The LP jumps with electricity as the quintet churns through 10 songs. 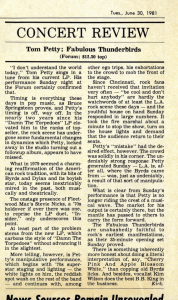 There's a lot of chatter about "new directions" for rock thse days, but Petty's boys demonstrate there's still plenty of life left in basic rock -- if it's done right.